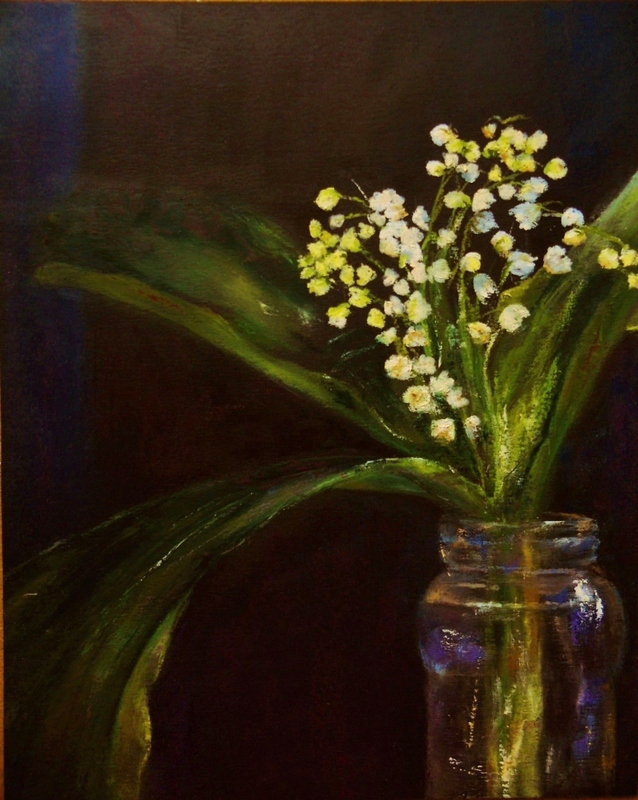 Lily of the Valley, an oil pastel (10×8) was painted on black Mi-Teintes pastel paper with Sennlier, Mungyo-Gallery and Holbein brand oil pastels. Tools used were my fingers for spreading the paint and a razor blade for special effects. I used to struggled getting a rich dark background to show on black paper, then I made a little discovery – begin lightly coating the background with Senneliers Mars black pastel – the OPs has an oily feel to it and is a wonderful rich black. From there you apply/layer whatever background colors you want to use – the Sennelier black underneath gives a nice foundation to mix with top colors. In this case Indio Blue and Magenta were used to get a rich and very dark feel to the background, although I’m not too sure the photograph has picked up the colors all that well. This entry was posted in About Oil Pastels, OPs New Paintings and tagged art, fine art, flowers, lily of the valley, Oil Pastel, painting, pastel. Bookmark the permalink. Love your composition and dark background here! Thank you so much Denise – I really appreciate it! Thanks so much Rita for your generous feedback and thoughts on this painting!! I have always marveled at your darks, Mary. They are superb! Thanks so much Leslie – the darks gave the lily just the right contrast to showcase the flower in this piece. Thanks for your compliment and noticing. Hello Mary – you are most welcome! Thank you so much Amy – this was an amazing project to work on. Developing the background was a fascinating process. Hi Louise, thank you very much for your lovely and generous comments on the Lily painting. I’m so glad you enjoyed the piece. Happy to see you Janet – glad you are back. The quote is pretty cool and if it isn’t true! Thank you so much for your lovely feedback, you know I always appreciate your encouragement and support – hope you have a lovely week ahead. Mary, this is absolutely beautiful. I have been following you from a quiet distance but feel the need to say this! Thank you so much for your lovely comment – means a lot to hear from you. Love your photography, btw! Lovely. A bit of time held delicately in paint. Oh I do like your lovely description Brenda – thank you so much!! The background is gorgeous! Lovely contrast to the cream colored flowers. Great to see you Jess, thank you so much – it was great fun developing the rich background. Lovely work, Mary. I particularly like the vase. Thank you Violet ~ hello to Malus! professional and eye pleasing Mary, as always! Thanks Heath for your generous words – I really enjoyed working out this painting. Thanks BB, appreciate it – nice to see you again! a marvelous blue on the black! it’s like velvet! Thank you so much Dsaquarelles for your kind thoughts – glad you saw the blue, a little surprise. This piece is one of my favourites. Thank you so much Mihrank, your response to the piece means a lot. Thank you so much Marina – always love receiving your response to the painting. I hope you have a wonderful weekend my friend. Beautiful painting. I was not aware one can achieve such rich darks with pastel – you give me hope! Hi Fritz, thank you very much for visiting and commenting – much appreciated. The Mi-Teintes black paper is too dull for me, so to get it richer before I lay in background colors I lay on a thin base coat of Senneliers Mars Black oil pastels (they highest quality OPs that has a nice level of oil in the formula). So layers of colors that are put down over the Mars Black tend to take on a beautiful and rich tone – in this case indigo and magenta. I hope this helps. I saw your blog, you have a wonderful collection of paintings. Thanks again, very nice to meet you. Many thanks for the information Mary. I am just getting started with pastels, and have a lot to learn about surfaces. This is quite helpful. Thanks for the comment on my paintings! This is my fave painting of yours….ever! It is the flower my mom loved most & I adore them and the scent is heavenly. Lily of the Valley and Lilacs are very meaningful to me. You really outdid yourself here! This is very special response Resa – I’m so happy that I was able to touch you in such a way with this painting. Lily of the Valley are so precious as flowers – the scent is fantastic! Thank you for your beautiful compliment. Fabulously tactile and so stunningly beautiful! Thank you for sharing. Love your description, thanks so much for taking time to comment. My lily of the valley will be out in about 6 weeks from now. In the meantime I can enjoy your beautiful take on one of my favourite flowers. I am in agreement with all the other commenters on how superb this painting is. Thanks Gallivanta, means a lot. There is no replacing the real thing though – hope you enjoy your bounty of flowers when they come out! Very cool Rebecca, thanks very much! Wow! This is incredible, Mary. The colors are gorgeous. Well done! 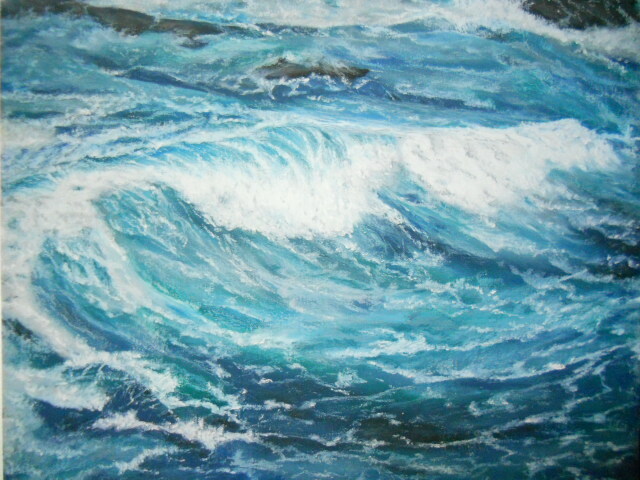 Thanks so much Jill for your enthusiastic response to the painting – you know how to make my day! It really is stunning, Mary. Thanks Derrick – I enjoyed your description. 🙂 Wow, amazing!!! Looks like photo – Excellent painting, Mary!!!! Thank you so much Rexlin, means a lot to receive your generous feedback on this piece. Thank you Debi. I was worried that the small petals with oil pastels would be a bit too messy, so to read that you see them as delicate (yeah, that makes my day). I love this! Especially the colors. Very cool Nicodemas, thank you so much for your enthusiastic response. Do you sell your paintings? This is beyond gorgeous. Hi Judy, thank you for your generous thoughts. At this time I don’t sell my work, but will let you know if I make the move to start selling. Your work always amazes me but those lilies of the valley pulled at my heart. They were one of my Mom’s favorites and the dark background would match my entertainment center. 🙂 Your work is beautiful, Mary. Beautiful words Judy. Thank you for your generous compliment, I’m happy that the piece connects you to your Mom it is for me what makes painting very special. Yes!!! Love this bunch for summertime. So, so rich and yet delicate. I have been behind on reading posts so I know I have missed some of yours but glad I did find this one. That means a lot Coastal, thank you for taking the time to visit and commenting. I’m so glad you enjoyed the painting. I don’t want summertime to end. Thank you so much Sylvia – love to hear when a painting gives such a response. Thank you Holly – means a lot! The contrast between the flowers and the background is great and make them stand out. And the glass of the vase is so realistic…really a great painting, bravissima! Truly enjoyed reading your thoughts on this painting Robert and what captured your attention. Thank you so much – loved working the vase on this one, lots of great colors came through. You know how to make my day Sarah, thank you for your great descriptive my friend. I stopped, I gasped, I said “Oh Mary!”. This one is stunning. The contrast between the flowers and back ground and the lighting is superb. My oil pastels are officially collecting dust while I play with water color. Perhaps I will challenge myself, get the oil pastels out and play with them one more time. You are so funny Susan and I’m loving it! Thank you so much for your generous feedback on the contrast – your reaction was what I was hoping for. Oh please do, it’s time to dust off the oilies and give them a go!! Your work would be magnificent. That black background and paint really make the vase and flowers stand out. I like this painting a lot! Thanks Hien – the black background has a lot of indigo and magenta, giving it the richness to let the flowers take center stage. Thank you for noticing – I really appreciate it. Thank you very much Dorann!!! Hi Eva, so glad you enjoyed the piece – thank you my friend. Thank you, your reaction means a lot!